Daufuskie, a Muscogee word meaning "sharp feather" or "land with a point," is an island located between Hilton Head and Savannah, bounded by the Calibogue Sound and the Cooper River. With no bridge to the mainland, the island maintains a distinct allure. Home to Native American tribes, a paradise for pirates, and a strategic military outpost, Daufuskie held enslaved Africans brought by plantation owners as chattel to build their wealth. 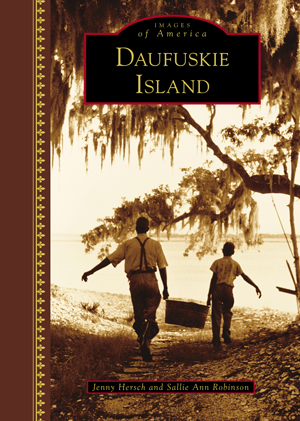 After the Civil War and occupation by Union soldiers, freed slaves from the Sea Islands and surrounding states settled on Daufuskie as landowners and sharecroppers. Daufuskie's population fluctuated in keeping with local industries, and those who stayed often relied on farming, hunting, and fishing to survive. Electricity was brought to the island in the early 1950s, and the first telephone rang in 1972. Today, historic sites, restaurants, outdoor recreation, and scenic beauty draw visitors and residents to this unique community. Daufuskie Island is part of the National Park Service's Gullah Geechee Cultural Heritage Corridor and is listed in the National Register of Historic Places. Jenny Hersch first visited Daufuskie in 2000 and has called the island home since 2013. Sallie Ann Robinson is a sixth-generation Daufuskie native, cookbook author, celebrity chef, and certified nursing assistant. She is known as “Ethel” in Pat Conroy's memoir The Water Is Wide. Together, they have done extensive research and gathered stories and photographs from island residents, visitors, libraries, and archives.